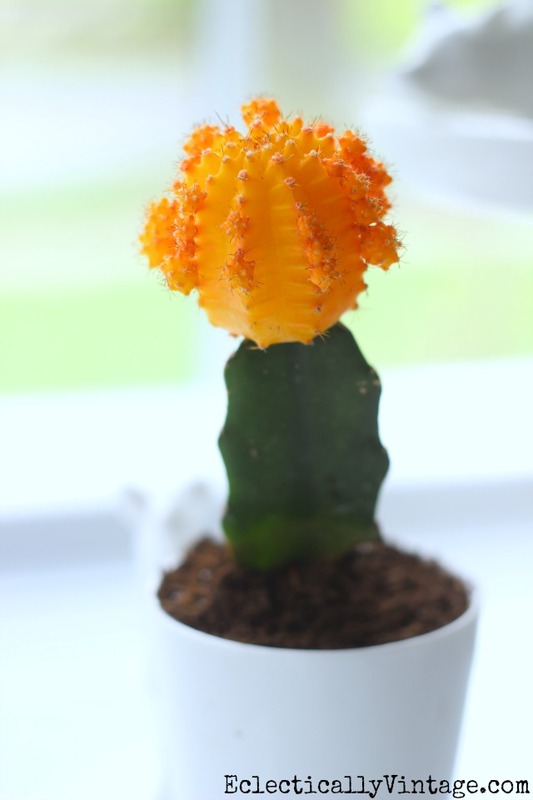 Growing up, I had a tiny little cactus plant in my room. I lovingly cared for it as I listened to Kenny Rogers belt out The Gambler on my little blue record player. My cactus was planted in vibrantly colored sand in the clear glass vase. It grew happily for a long time until one fateful day, it shriveled up and died. Since then, I’ve been a shell of my former self. 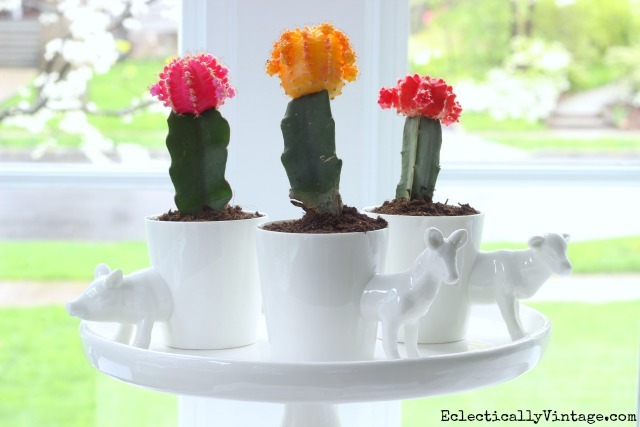 Because now I have three cacti – moon cacti to be exact and they are fun and colorful and easy to care for. I decided to give my succulent clam shell some friends. The magic of grafting – a moon cactus is a small grafted cactus which means the gardener takes two different cacti, cuts them and grows them together to create one plant. The top part of the moon cactus doesn’t have chlorophyll (which makes plants turn green) so these beauties turn different shades of yellow, orange and red and pink. 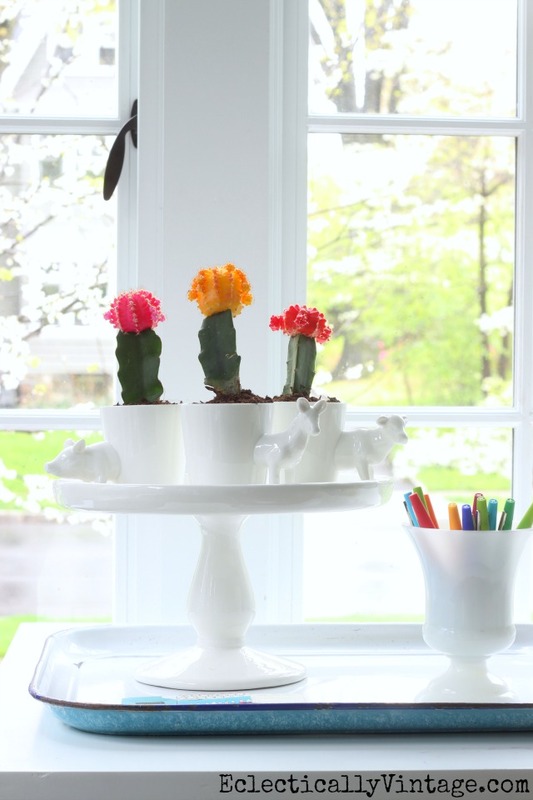 I love the way they look on my sunroom desk and I also love using cake stands (like this one from HomeGoods) to display favorite things. Wow these cacti really bring back memories. I wonder if my mom saved my little blue record player? Check out the easiest way to grow succulents. Kelly, these are so cute and those animal cups are adorable!! How fun! Ok , Kelly – it getting scary with us! Same name, same blue record player, same cactus! ( I was listening ti Cher though – Gypsies Tramps & Thieves over & over. Interesting to learn how the tops are so vibrant! Glad to have joined this fabulous group! 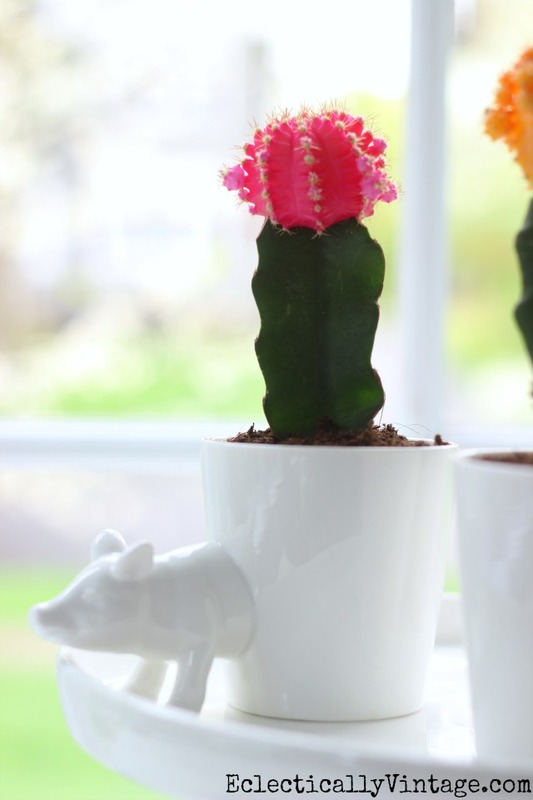 Loving the cactus, super cute! Where have these cuties been all my life! Love them and those cups! Please! 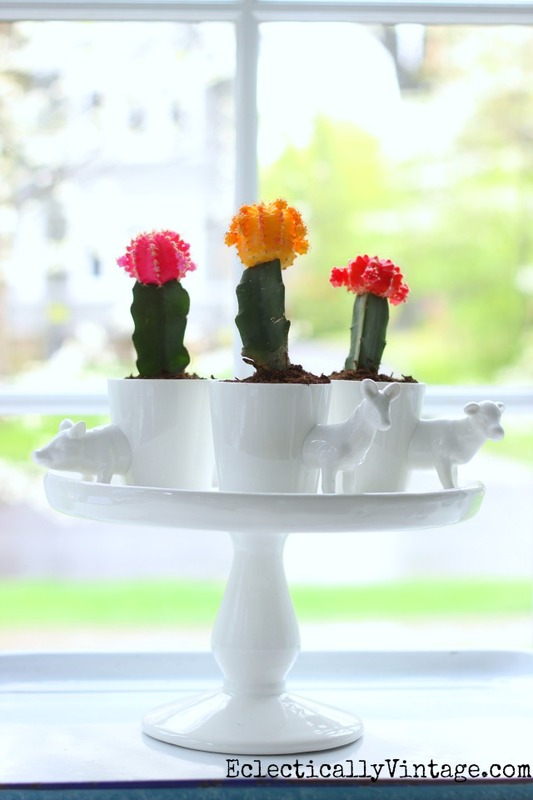 Great to learn about the Moon Cacti….love those over the moon cacti planters!